Tabla chef Floyd Cardoz and Picholine and Artisanal chef Terrance Brennan each are putting their energies into opening new offshoots. 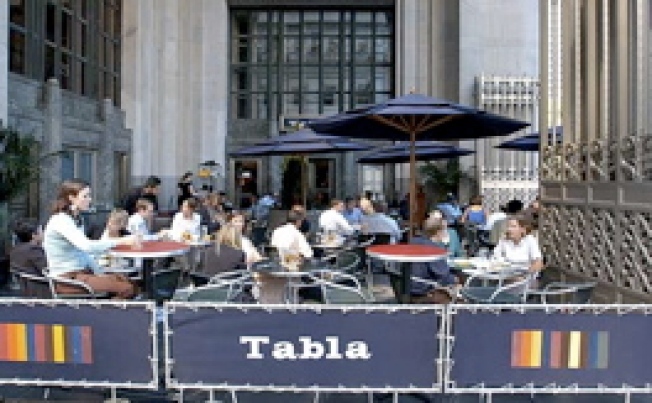 "We are looking to open an offshoot of Tabla with a more adventurous menu. I want to do some of the street food and simpler dishes I grew up with. Lamb feet, brains, liver, whole small fish fried...It will be an intimate restaurant with an open kitchen serving small plates, in the same neighborhood." "Terrance Brennan tells us that he’s looking at spaces in Chelsea, the West Village, and the Upper West Side in hopes of launching a new concept, the Artisanal Table: Pizza, Tapas, and Wine Bar....Dishes will be $15 to $20. 'It’s a good time to be looking,' he tells us, 'because a lot of restaurants are going under'." As weaker restaurants fail, the strong will come in and pick up the pieces. We'll be keeping an eye on how both projects progress.